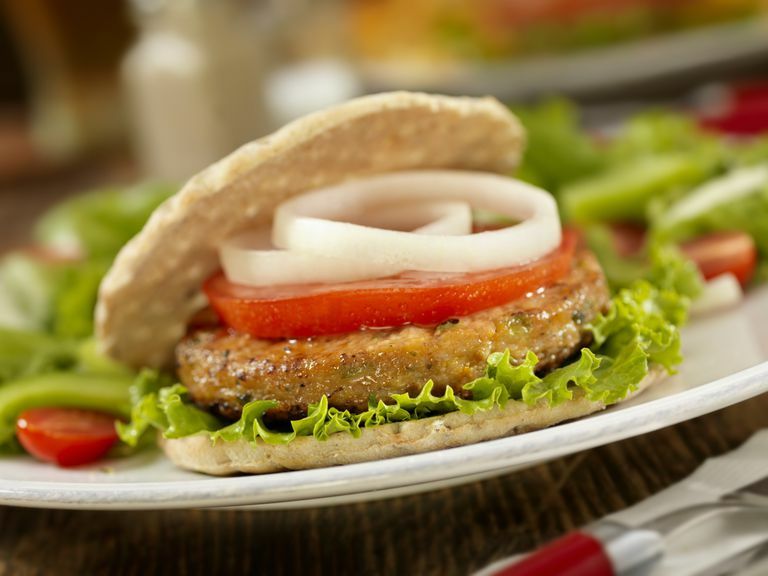 Do Veggie Burgers Contain Hexane? Question: I like those frozen veggie burger patties that I buy at the grocery store, but the other day a lady told me they've got hexane in them. Hexane sounds bad; what is it? Do veggie burgers contain hexane and does this mean I shouldn't eat them? Answer: Veggie burgers don't contain any hexane. In fact, they can be used as a healthy protein source for vegetarians. The United States Food and Drug Administration (FDA) does not require foods to be tested for hexane levels — probably because the chances you'll experience any meaningful exposure from food is highly unlikely. You're much more likely to be exposed to hexane through gasoline fumes, quick-drying glue, and cleaning solvents than you are from any amount of foods you eat. Hexane is a solvent made from crude oil. In the food industry, hexane is used to extract the vegetable oil from plant seeds such as canola, soybeans, sunflowers, and corn because it is more efficient and less expensive than squeezing out the oil with presses. The hexane is removed from the oil before it is bottled and sold, but there is always the potential for some hexane residue to be left in the oil. The FDA hasn't established a limit on hexane residues in foods. However, it has set limits for residue levels in hops and fish meal protein. Since it isn't something foods are usually tested for, it's difficult to know how just how much hexane might be in any foods you buy. It's also unknown how much foodborne hexane might cause a problem although current research indicates it would take magnitudes more hexane than what is possibly found in the diet. The Cornucopia Institute, an organization formed to support organic and small-farm agriculture, claimed that soy-based foods such as veggie-burgers and certain nutrition bars could potentially be contaminated with hexane. They based their conclusions partially on a small study in Switzerland that looked at (among other things) hexane levels in Swiss cooking oils. None of the oils contained more than 0.13 milligrams per kilogram of oil and 88 percent contained no traces of hexane at all. The institute also sent one sample of soy meal and grits to the FDA for testing. The samples contained residues of hexane (21 and 14 parts per million), that are similar to limits set for hops extracts by the FDA. Since many vegetarian products and nutrition bars use soy protein as an ingredient, the institute fears that non-organic or partially organic brands of these foods might be contaminated with hexane. Hexane is toxic, and exposure to large amounts of it can cause neurological damage. But it doesn't come from food. Hexane exposure is likely to happen to people who work at oil refineries and other places where hexane may escape into the air. Current toxicology research focuses on industrial and airborne exposure to hexane, so it's not clear how much hexane exposure from foods would be dangerous. The EPA has estimated that consuming less than 0.06 milligrams hexane per kilogram of body weight is probably safe. For a 200-pound person (97.7 kilograms), that would be about 5.8 milligrams per day. A typical diet, even one with a lot of hexane-extracted vegetable oil, would fall very far short of that. For example, the oil in the Swiss study with the most hexane contained 0.13-milligram hexane per kilogram of oil, so a 200-pound person would have to consume over 40 gallons of that oil to even come close to 5.8 milligrams hexane. Is it difficult to avoid hexane? Most hexane exposure comes through the air, however, if you wish to eliminate hexane residues from your diet, you can choose foods that are "100-percent organic" and oils that are expeller-pressed rather than solvent-extracted. Expeller pressing is not as efficient as hexane extraction so oils made this way are going to be more expensive. Keep in mind that labels that state the product is made with organic ingredients may still use ingredients that have been exposed to hexane.